It has been an awesome start for Danys Baez. Just 13 months removed from major Elbow surgery, he is back on his way to being one of the top relievers in the game. His best season came in 2005, with the Tampa Bay Rays. That season he made his one and only All-star game, and finished the year with a 2.86 ERA and 41 saves in 67 games. 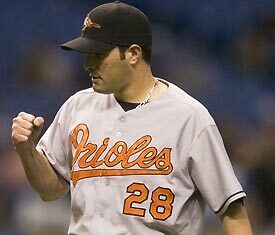 After a 2006 season with the Braves and Dodgers, he signed a 3yr/19 million dollar deal with the Orioles before the 2007 season. It quickly turned into a nightmare for Baez, as he had a bad ERA of 6.44 in 53 games. Then, it got worse for Baez. He missed all of 2008 with that elbow suregery previously mentioned. Baez has been one of the top relievers in the game, as he has a 3.99 ERA, 114 saves, 33 holds and 33 wins in his 9th professional season. This is just a quick biography of Danys Baez. Baez has been huge for the Orioles in 2009. He has been the Orioles most reliable reliever so far, as he has a 2.30 ERA in 9 games so far this seasom. He also has 13 strikeouts in 15 and 2/3 innings. He is also 2-1, for what its worth. I wouldnt be suprised if Baez was called on to close out some of the games with this shaky bullpen situation, as he has had success as a closer in the past. He had 96 saves in 3 seasons from 2003 to 2005 with Cleveland and Tampa Bay. The good thing about Baez is he is very hard to rattle, he always has ice in his veins and gets out of tough situations very regularly. He can also eat up innings, as he did come up as a starter, he had 10 wins in 26 starts in 2002. And he is just 31 right now, and has a good amount of good seasons left in him i think. Even though he didnt do much in his 1st two seasons in Baltimore, this is a public service announcement. The Orioles need to re-sign him for 2010 at least. He is getting back to his old form, and that cant hurt the Orioles at all, as we know what he can do when he was on his game when he was a Ray. He also provides good vetern leadership and can teach these big top reliever prospects a thing or two about pitching in the majors. I was against him even making the team in spring training, unsure of how good he would be after the surgery, but he has become one of the Orioles big suprises of the early year, and am a big Baez fan this year, just like i was whe he first got to Baltimore. Thats it for now, check back tommorow for a new article. The O’s are back home. They are taking on the Minnesota Twins today and tommorow for yet another 2-game series. The first game will be the Orioles Mark Hendrickson versus the Twins Kevin Slowey. The O’s are 10-17 and 8 games back from the lead in early May, and are trying to get back on track after losing 7 of our last 8 games. Now that you have the breakdown, i will give you the keys to the game. #1- Shut down Slowey- The 25 year old Texan is doing well again in 2009. He is 4-0 with an unspectacular 5.17 ERA. He can eat innings, averaging about 6 a game, and you have to hit him hard and early to beat him to the punch. He also has 23 strikeouts in 31.1 innings. Actually, this isnt the biggest concern, ill show you why he is 4-0 despite the 5.17 ERA, and thats the Minnesota offense, as they have scored 35 runs for him in 5 starts. let me explain. #2- Slow down the Twins offense- like i just said, the Twins are tearing the cover off the ball lately. They are averaging 6.8 runs scored a game in their last 5 games and the Minnesota Twins have six hitters over the .300 mark, and have 19 homeruns in the early season, if Hendrickson can hold these guys in check in the littlest bit, our offense can jump on Slowey. #3- Hendrickson has to pitch decent- That brings me to my next point. Hendrickson is 1-1 and has a 4.97 ERA in two career starts versus the Twins. If he can just throw strikes and avoid getting hit with the longball, he should be good for 5 or 6 innings. The longball has been a problem for Hendrickson in 2009, as he has allowed 7 in 23.1 innings. He needs to let the defense, which has been great lately, exept for last night, to make the plays when they come to them. Hendrickson is trying to improve on his 1-4 record and his 5.79 ERA, and his 4 start losing streak. #4- top of the line-up needs to stay hot- Espically Brian Roberts, who is hitting .313 in 2009, is 3 for 8 after an 0-18 slump. He hit .423 in 26 at-bats versus Minnesota in 2008, and needs to keep that success. Adam Jones (.350 AVG) and Nick Markakis (.356 AVG) also need to stay hitting for the O’s to have a chance in this game. Prediction- It will be a high scoring game today. Both offenses are very potent, and can put up runs in a hurry. It all depends on which pitcher controls the damage the most, and what offense strikes hard first. My projected socre, Orioles 7- Twins 5. Closer job up for grabs? At the press conference of the O’s 4-3 loss to the Blue Jays and the end of the 3 game sweep of the O’s, manager Dave Trembley was asked a question about the closer situauton, and Trembley said it was ‘day-to-day’. Let me put this in other words: other people than George Sherrill, the O”s representative in the 2008 All-star game, will not be the only one getting save oppurtunities right now. Trembley said he will do what is best for the team to get back on track and start winning. Sherrill has struggled this season, going 4 for 6 in save oppurtunities, which is decent, but he has a 5.06 ERA and has allowed 3 homeruns, two which gave the opposing team the lead. And it was noted in the Baltimore Sun that Sherill is allowing righties to hit .394 off him in the early goings. Thats pretty bad. It also states that Trembley said that Sherrill is putting pitches in bad spots and is getting hit, spots he didnt put pitches in last season. And the most worrying stat is that Sherrill has blown 6 of his last 8 one-run lead save oppurtunities, and dating back to last year, is just 13 for his last 19. That is also, not good. Who could be getting save chances you ask? Well, two names pop into mind, and thats the O’s top set-up guy in Jim Johnson, and O’s top long relief pitcher, Danys Baez. Johnson has a 2.70 ERA in 10 apperaences in 2009, posting 10 innings pitched and 7 strikeouts, while Baez has a 2.63 ERA in 8 appearences, posting 13 and 2/3 innings and 12 strikeouts. There is a good chance that both of these guys would be good closers, and im all for them getting a oppurtunity here and there, but i will give you a couple good reasons why not to push Sherrill out just yet. For one, it is early, and it is only 6 oppurtunities. If it was 12 for 20, it would be a problem. Two, throwing someone else in the closer role could mess up some of the good things we have going in the otherwise sturggling bullpen. Johnson is one of the games top young set-up guys, and who are you going to put as the set-up guy if Johnson is closing? Sherrill will have some sort of adjustment going back to set-up duty, and his confidence might be damaged, and then you have Chris Ray, who is still looking to get back on track, posting a really bad 7.56 ERA. Then if you put Baez in, who do you have to pitch long relief? Albers and Sarfate, two long relievers you needed to do good, are sturggling and in AAA and the other is hurt. So then you have no long reliever. Not good. Look, i cant say for certain that Sherrill will bounce back and be his old All-star form again, i just cant. Maybe the scouting report got out on him really fast, and he is having trouble counter-adjusting, I have no idea, im not George Sherrill. If he continues to struggle in a month or so, then look for a replacement for closer. But hey, if we do put in Johnson and he goes 10 for 10 with a .50 ERA, then thats that. But dont act like Sherrill is just a stopgap, because hes not. Here, ill give you a 80 percent chance he bounces back by the end of the month. I just have a hunch that he will be fine. It is early May, and the Orioles are struggling. The O’s started off 6-2, but since then are just 3- 14. It has mainly been the pitching that has let down in that stretch, such as players like Hendrickson, Eaton, Albers, Sarfate, Sherrill,Bass Ray, etc. And that brings me to my next question. Why are we letting these players continue to struggle when our minor leaguers down in AAA are still ripping it up? You saw the last call up, when Sarfate went on the 15-day DL, we called up Bob McCroy, who in 9 games and 12 innings in Norfolk, posted a 2.25 ERA. Thats only one case of it. 9 of our 13 active pitchers have a 5.00 ERA or more, and that includes staff ace Jeremy Guthrie, who should be fine. 5 of the 13 have a 6.00 ERA or more, and 3 of them have a 7.00 or more. A freakin 7.00 ERA! Take a guy like Ross Wolf. In 17 and a third innings, he has a 2.08 ERA. Wolf is already 26, and you’re telling me he isnt better than Brian Bass, or somebody like that? The stats beg to differ. I like what we have done with Montanez and Pie, even though they are stuggling as of late, we are letting them ride it out and hopefully they will find out what the flaw is with time. A guy like Wolf, or Jim Miller, guys who are 26 or 27, how are you supposed to know what they can do if you dont call them up? You cannot know if you never give them a chance. Guys like Miller and McCroy have had little stints in september before, but you have to give them more than 1 month. Look at Jim Johnson, he sucked as a starter for 2 little call-ups in 2006 and 2007, but in 2008 we switched him to set-up and we automatically found our top set-up guy. A year like 2009 is the perfect year to call these kids up, not just the older prospects, guys like Chris Tillman, David Hernandez, Nolan Reimold, Scott Moore, Matt Wieters, hell, even Jason Berken, who has done good in Norfolk in 2 starts, going 10 scoreless innings, allowing 4 hits and striking out 4. And then in 2010, Patton, maybe Matusz, etc will be ready. And bam! all of a sudden the Baltimore Orioles are contenders again, just they should be. It can happen, and hopefully the F.O see’s it. Andy Macphail has been talking about this for a couple years, and i think 2009 should be the testing year if we cant get back on track. Then you will see major, big results in 2010. And even bigger results in 2011. Its bound to happen, and i say right now is the time. You could actually go a lot of different ways here. We have had a lot of good hitters early this season, and its very close. I will breakdown each of my 4 canidates for Orioles April MVP. #1- RF Nick Markakis- .381 AVG, 2 HR’s, 21 RBI, 9 doubles- Markakis has had himself one of the best April’s in the whole league. Not only is he still around the .400 mark, he has already driven in 22 runs, a quarter of what he did last year when he drove in 87 RBI. 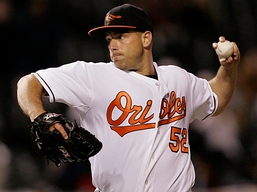 He is also the O’s franchise player and one of the team leaders and he has acted and played like it. Nobody knows where we would be if it wasnt for Markakis. Not to mention, he has the longest streak of getting on base in a game in the MLB. #2- 2B Brian Roberts- .356 AVG, 2 HR’s, 7 RBI, 19 runs, 3 SB- Roberts also has had himself a good month, thats why he is on this list. He has proven again that he is one of the best lead-off hitters in the game, and he is still doing it with a .426 OBP, a full .069 higher than his career average. He is also one of the best fielders at second base, putting himself in the early gold glove talks already. He is definally showing why we gave him that huge extension. #3- CF Adam Jones- .359 AVG, 4 HR’s, 18 RBI, 24 runs- Jones had himself a good rookie year in 2008, and has definally improved in year 2. He is looking more relaxed at the plate and his discipline at the plate is a lot better, result- a .359 average. Jones is another reason why we are doing so good on offense, and is one of the games top young players. Like Markakis and Roberts, he is also a great defensive player as well. Jones is definally one of the franchises stars, and hopefully we will see him patrol center field and camden for a very, very long time. #4-1B Aubrey Huff- .273 AVG, 3 HR’s, 19 RBI, 11 runs- Huff has had a pretty good year, and is one of the 4 reasons why we are leading the league in batting average from hitters 1-4, and as you may have noticed, every player on here is batters 1-4. Our hitting has been the highlight to a decent April that ended on a slump, but if these guys keep hitting, we should have an even better May. Huff is always good for a hit in every game in 95 percent of the games, and he is a very good defensive 1B as well. Huff is one of the vetern leaders, and he is one of the reasons that this team has stayed so close together( which is great after what he said when he first came here, you know what he said). Heres to you Huff, and keep on hitting Homers into Eutaw Street. And there is the finalist…….. and the winner is………………………….. Nick Markakis! He had too good of a month to give it to anybody else. What do you guys think? Am i right? Am i wrong? Put in your input in the comment box. I’d like to hear what you all are saying and thinking right now. Oh, and if i could have put a 5th person in the mix, it would probably be Danny Baez or Jim Johnson, our two top relivers in the first month.